For years now the fashion set has been obsessed with Zara. There's an old joke that's applicable and it goes a little something like this. How do you get ready for Fashion Week? Cover yourself in glue and run through Zara. Yeah, that pretty much sums it up. It's a trendsetters paradise and it's mostly all designer ripoffs. 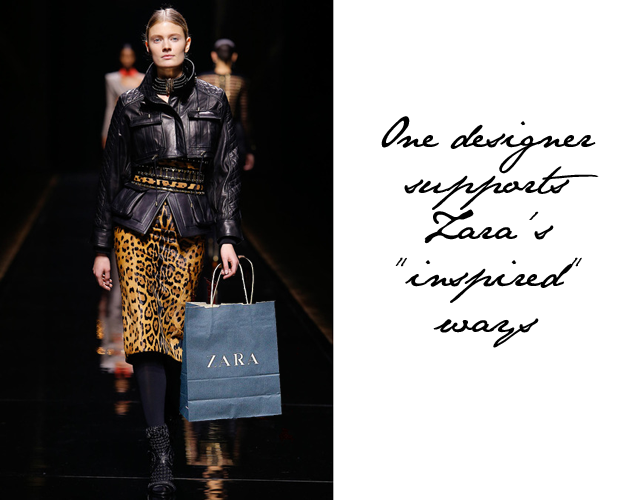 So imagine my surprise in reading this morning that there is one designer that is happy he's being copied by Zara and even thinks their windows and design concepts are genius. We have a feeling not all designers would be as "cool" as Olivier with their opinions on the fast fashion retailer. But we're giving Olivier some major thumbs up for keeping an open mind and remembering that "imitation is the sincerest form of flattery."